“Each one should use whatever gift he has received to serve others, faithfully administering God’s grace in its various forms.” (1 Peter 4:10). 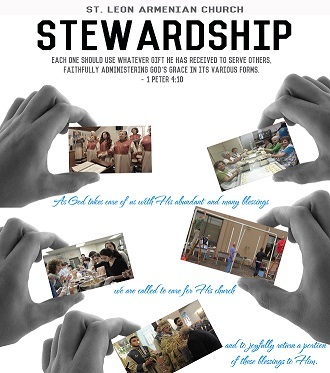 Stewardship is offering thanksgiving for the many blessings in our life. It is a commitment of our spirit and our commitment to God. We are called to offer back to our Lord all that we are and all that we have. Our commitments of time, talent and treasure reflect the gifts that we have and the gifts we can share. All that we have comes from God and we are called to return a portion to Him and His Church in thanksgiving. Stewardship is returning to God a portion of the gifts that He bestows upon us. We are called to do this as a testament of our faith and our support of God’s church as it does the Lord’s work in this world. As a community we rely on stewards to maintain the mission, ministries and activities of St. Leon Armenian Church. We are blessed to be a part of such a thriving and vibrant parish. Please consider making a financial commitment for the benefit of your beloved spiritual home. If you have any questions or would like to discuss stewardship, please feel free to contact the Pastor, speak to a parish council member, or call the church office at (201) 791-2862. You may also email the Parish Council Chairman, Steven Kachigian, at kachigianc@gmail.com . Thank you for your generosity and your participation in St. Leon parish life. print out the Stewardship Form below and mail it to the St. Leon office. Thank you for your support of St. Leon Armenian Church.